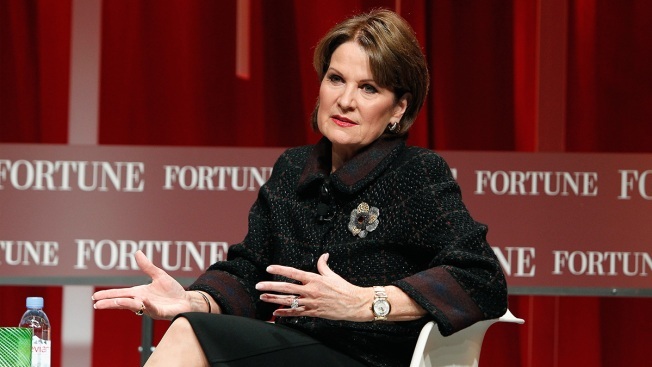 This October 13, 2015, file photo shows Lockheed Martin's Marillyn Hewson speaking onstage in Washington, DC. Less than 5 percent of the CEOs in the S&P 500 are women, but records show that most of them beat the index during their tenures. Of the 24 female CEOs in the S&P 500, 13 have led their companies’ stocks to outperform the index. Some have managed to produce triple- and even quadruple-digit percentage gains. Female CEOs may be few and far between, making up less than 5 percent of CEOs in the S&P 500, but history shows they’ve been able to generate big returns for investors. Of the 24 female CEOs in the S&P 500, 13 have led their companies’ stocks to outperform the index in terms of cumulative total returns during their tenures. Some have managed to produce triple- and even quadruple-digit percentage gains. The average year-to-date return from the 24 female-run companies was over 12 percent as of Friday’s close, according to S&P Global Market Intelligence, which has made it a mission to promote gender equality through its parent company S&P Global and the #ChangePays initiative. For comparison, the average year-to-date return for male-run S&P 500 companies was around 11 percent. Yet, even with these gains, the combined market cap of S&P 500 companies with female CEOs totals just over $1 trillion, while the same statistic for male-run companies exceeds $24 trillion. To make matters more complicated for female CEO hopefuls, the percentage of female CEO appointments at S&P 500 companies has actually dropped in the last decade, averaging less than 6 percent in the last four years, according to Katie Darden, associate director of financial institutions research at S&P Global Market Intelligence. The biggest outperformer of female-run S&P 500 companies is health-care-focused real estate investment trust Ventas, which has generated a cumulative total return of 2,559 percent since CEO Debra Cafaro took over in March 1999. The S&P’s cumulative returns for the same period is roughly 215 percent. Other companies that handily beat the S&P’s performance include Advanced Micro Devices under CEO Lisa Su, with a nearly 427 percent return; Lockheed Martin under Marillyn Hewson, which has returned 293 percent to shareholders; Ulta under Mary Dillon, who has driven returns of nearly 226 percent; and Ross Stores under Barbara Rentler, with 175 percent returns. Kohl’s CEO Michelle Gass, Anthem CEO Gail Boudreaux, Progressive Group Tricia Griffith, Alliant Energy CEO Patricia Kampling, General Dynamics CEO Phebe Novakovic, American Water Works CEO Susan Story, Arista Networks CEO Jayshree Ullal and Northrop Grumman CEO Kathy Warden have also produced higher cumulative total returns than the S&P. Darden’s research in partnership with Kensho also found that investors tend to balk when companies elevate women to chief executive positions, with underperformance hitting 1.8 percent after three months. While their companies didn’t produce the gains needed to beat the S&P during their tenures, IBM CEO Ginni Rometty and General Motors CEO Mary Barra have made huge impacts on their organizations. Under Rometty, IBM changed its stripes to fit the new era of technology, doubling down on artificial intelligence with IBM Watson and most recently purchasing cloud computing company Red Hat, setting Big Blue apart from the rest of its rivals. Barra has helped her massive automaker focus on selling more popular trucks and crossovers, successfully cut costs and brought new focus to GM’s electric car and autonomous vehicle initiatives. The market might not always have faith in female leaders, but records show investors might need to rethink that calculus. Not only would encouraging women to join the broader workforce add nearly $6 trillion to the global market cap in 10 years, according to S&P Global, but matching the number of women to the number of men in the workforce could at $12 trillion to the global GDP by 2025, says McKinsey. But Darden’s still hoping for a day when gender exits the picture entirely. A final thought: The YWCA Impact Shares Women’s Empowerment ETF, which tracks an index of companies around the world with strong policies focused on women’s empowerment and gender equality, is outperforming both the Dow Jones Industrial Average and the S&P 500 this year. So, for those considering where to put their money, history shows it might be more lucrative to bet on ladies. All cumulative total returns were calculated via FactSet. Data points provided by S&P Global Market Intelligence, Catalyst and McKinsey & Co.